It started back in April soon after we installed wood flooring in our livingroom and hallway. I had longed for those floors for years, but as much as I enjoyed them, it only took me about two days to realize there were some drawbacks. For one, we cohabitate with two long haired dogs. They replace all their body hair about once a week. They’re kind enough to do this all over the house. And when they shed on carpet the hair stays on the floor until you vacuum it up. But when they shed on a wood floor the hair clumps together, collects in corners and sometimes turns into tumbleweeds the size of small rodents that lay in wait for a socked foot to attack. The only solution, of course, is to vacuum. Obsessively. Which I did every day for several weeks. Until I happened to mention the problem to my sister-in-law and she told me about a little machine she had invested in for her own home. She sang its praise to the point I started to see fireworks. I imagined R2-D2 whirling around my floors with an apron and broom while I drank lemonade and stuck out my tongue at my old vacuum cleaner. Her words “I can’t remember the last time I used a vacuum cleaner” bounced around my head for days until I confessed to Caleb my new obsession. A week later we owned a cleaning robot of our own. Even a refurbished one was a splurge for a household cleaning product so I mentally ticked a year of my future Christmas, birthday and anniversary gifts off. And you know what? It was completely worth it. 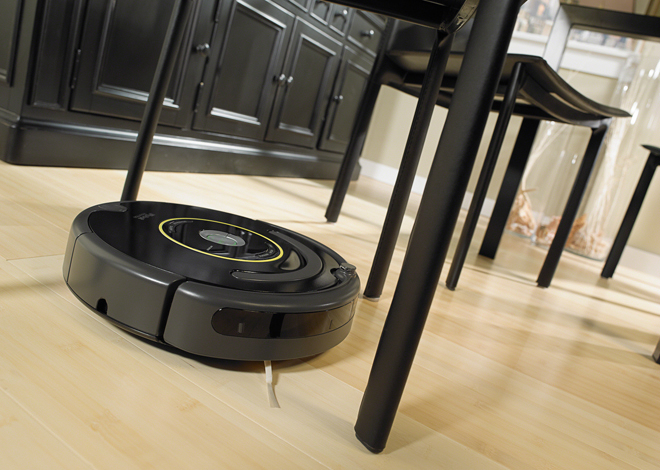 After the first trial run, where we followed the robot around the house and watched it clean the floor like we had nothing better to do, I quickly learned how to never use my vacuum cleaner again. It was almost too easy. I’d get the boys off to school in the morning and on the way out the door I’d turn on the robot. By the time I got home from the grocery store the floor would be clean. It ran every day so we quickly forgot what grapefruit sized hairballs looked like. It was every bit as awesome as I’d imagined. And then something happened. A scenario I’d actually considered once in my mind and quickly dismissed it as my worst nightmare. May we never speak of it again. Except then it happened for real. On a Tuesday. The day after Piper found a door left open, escaped from the house for ten minutes and had a nice little romp in the woods where we dump the dirty contents of the chicken coop. She must have also had a snack or two because the very next day she was sick as a dog. I couldn’t even finish cleaning one of her explosions before she’d drop the next. The smart thing to do would have been to put her outside once I realized how sick she was, but I was still trying for compassion so I kenneled her instead. And of course the very next bout of diarrhea was all over the inside of her cage. I guess that was the point when I mentally shut down because I proceeded to let her loose in the house while I cleaned up. And if you can guess where this is going you’re probably cringing or muttering “ew” because yes, while I had my head and a bottle of disinfectant inside her kennel she pooped on the kitchen floor. And when I came around the corner I found the Roomba valiantly trying to clean it up. Just so we’re clear, that little robot could handle a lot of messes. Every day for many months it cleaned up bits of dried poptart, playground sand, wisps of construction paper and hairball monsters (of course). The one thing it could not handle was a dog made bomb. But it DID try. It vacuumed up much of it and ran through more, tracking it across the floor and carrying the rest caked in the crevasses of its underbelly and wheel wells. I was truly speechless and morbidly horrified. Oddly enough, that floor mess took me longer to clean up than all the others because I wasn’t sure where all the Roomba had been so I was compelled to mop everywhere. By the time I got ready to tackle the robot I was on a time crunch. The boys were off the bus and I was on the verge of making us late to taekwondo. And that was when I slipped and dropped the Roomba in the bathtub. Other thing the Roomba couldn’t handle: a half inch of dirty water. In fact, that was the last straw. The little wheels spun one last time as a toasted electronic smell wafted through the air. And then it died. There are so very many morals to this story, but just to name a few: never hold a very expensive piece of equipment over running water, no matter how much it reeks of dog dookie. And also never trust a dog whose nickname is “Pancake”, no matter how many times you tell yourself she can’t possibly have any more in there. And never grow dependent on a cleaning machine that requires a circuit board, no matter how wonderfully it treats you. I can hear my old vacuum cleaner calling from the closet “Pick me! Pick me!”.